Jaguar has announced that award-winning British Actor Damian Lewis will play the lead in a short feature film called Desire for the luxury car brand. Actors Jordi Molla and Shannyn Sossamon have also been cast in lead roles in the film. Inspired by the Jaguar F-TYPE, the casting announcement was made at an exclusive pre LA Auto Show event hosted by Jaguar Land Rover at Paramount Studios, LA. Jaguar revealed the F-TYPE sports car to 350 VIPs ahead of its US Auto Show debut. The car made its dynamic entrance at Paramount Pictures Studios on a road built over the famous studio’s sunken water tank. Damian was not the only cast member in attendance at the event, his Desire co-star, American actor, Shannyn Sossamon, was also present. Additionally, guests were treated to the premier of a teaser trailer (watch here) for the movie, which will be filmed in Chile over a five-day shoot next week. The film tells the story of Clark (Lewis), who delivers cars for a living, running into trouble after a chance encounter with a mysterious, young woman (Sossamon) in the middle of a lawless desert. Directed by Adam Smith, this is a story of betrayal, retribution, passion and greed. Over the coming weeks, Jaguar will release exclusive content from the set itself in Chile’s Atacama Desert. This will give viewers the chance to get behind the scenes and really feel part of the production. Kai Lu Hsiung, Managing Director, Ridley Scott Associates comments: “We are hugely excited to be collaborating with Jaguar on this project, and to be working with such a fantastic cast. Throughout the project, Jaguar will be employing innovative techniques to share the film set experience and mastery with their audience. From using button hole cameras attached to the cast and crew; gaining insight from stunt coordinators and wardrobe; to setting up mobile Go Pro cameras on helicopters and cars to provide unique views from the set that viewers would never otherwise see. 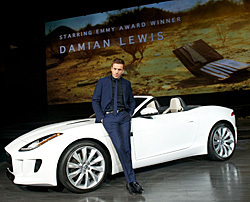 Adrian Hallmark, Global Brand Director, Jaguar comments:”The parallels between the world class creativity and technical capability that led to the creation of F-TYPE, and the unique collaboration between Ridley Scott Associates and Emmy award winner Damian Lewis are self-evident. The new Jaguar F-TYPE represents a return to the company’s heartland: a two-seater, convertible sports car focused on delivering performance, agility and maximum driver reward. The F-TYPE is a continuation of a sporting bloodline that stretches back more than 75 years and encompasses some of the most beautiful, thrilling and desirable cars ever built, including the iconic E-type. You can find out more about Desire by visiting FType.com.